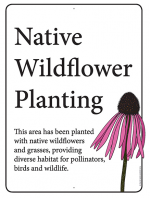 If you are a landowner looking for no mow/no spray signs or other signs for your wildflower, prairie, or pollinator habitat, here are some options and where to purchase them. If you are using these signs for roadside plants, contact your state department of transportation or your county roads department to see if you also need to be on their no mow/no spray list. They may have no mow/no spray signs available as well. For the Iowa Department of Transportation, call 515-233-7729 or 515-239-1628 and for the appropriate county contact in Iowa, refer to this list. Monarch Joint Venture has a good variety of educational signs and customizable signs on their webpage, including the above sign under the Customizable Signage tab.